I should be celebrating but, sadly, I’m writing this recipe with trepidation. In our family, tradition has it that Christmas breakfast is synonymous with Oyster Stew and Sausage Biscuits. This breakfast has been enjoyed by my mother’s side of the family since their boat ride from Belfast in the late 1700’s. So it’s a recipe with a history, even more publication justification. Yet my hands are shaky. 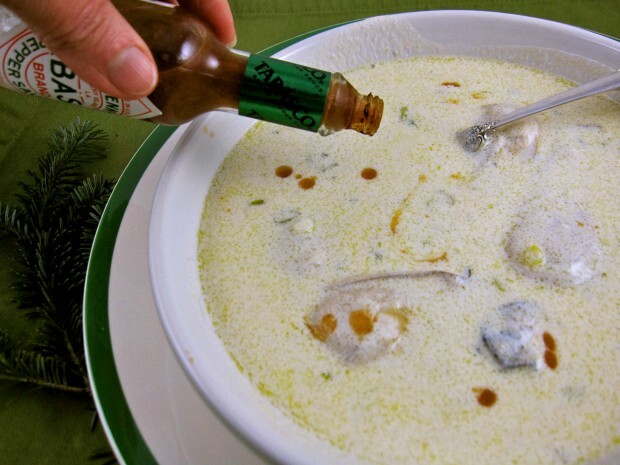 My family is superstitious and would rather subject our thumbs to a pilliwinks than not eat Oyster Stew on Christmas morning; bad luck would surely follow. Yet oddly, I can’t find an oyster stew recipe “penned” in any of our family cookbooks. Is there a reason for this? 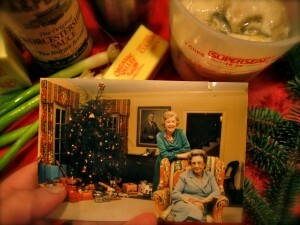 Will some Irish ghost from Christmas Past haunt my dreams for broadcasting this recipe…or worse? Eating Oyster Stew and Sausage Biscuits is one of my first memories. Every childhood Christmas recollection is ushered in by my grandmother, Mary Ellen, tasting and stirring the simmering stew. It was a recipe she learned from her grandmother. Seasoned heavy cream, whole scallions, oyster liquor and butter would steep slowly for hours on top of the double-boiler sauce pan, especially reserved for Oyster Stew. Before serving, the scallions were discarded and she’d put the oysters into the savory cream. The stew was complete when the oysters just began to curl around the edges. I would have second and third helpings, eating to the point of illness, which was another family tradition involving this stew. When my grandmother died, my mother inherited the white enameled double-boiler and took over the Oyster Stew “non-penned” recipe as well. Mother was a “modern” cook and didn’t have the patience for a two to three hour simmer prior to breakfast. There were presents to open and Bloody Mary’s to sip, a full stomach was required for both of those activities. A roux, instead of time and heavy cream, quickly thickened the stew. Mom further monkeyed with the recipe substituting half-and-half for the cream, chopping the scallions and actually leaving them in the stew. This was sheer heresy from my point of view and I was anxious to take my turn behind the double-boiler to reclaim my grandmother’s recipe. My turn came much too soon. Several years ago, I inherited the double boiler and memories of both recipes. I prepare it the way my mother did, making a roux and leaving the scallions in the stew. The only additional change I made was to lighten the stew even further by substituting whole milk for a portion of the half-and-half. It never tastes as good as my grandmother’s heavy cream version. The big secret, however, is not in the ingredients list but in the technique: Do not let the stew so much as break a bubble at the simmer or it may separate. I’m aware that the more I reduce the cream, the more likelihood the soup will “break”. So I hope my children will put on the breaks with this recipe, if anything, putting the cream back into the stew. The fact that a family in Kilcolgan County, Ireland could be reading this Christmas memoir at the same minute my family is savoring Oyster Stew would be unfathomable, indeed supernatural, to my ancestors. This may, indeed, heat up a Irish tempest in a Tabasco bottle. And pass that bottle, if you please. This stew is delicious with a fried sausage patty stuffed into a freshly baked biscuit. Drain the oysters, with a fine mesh strainer, reserving their liquor. Let simmer 45 minutes to 1 hour, stirring and whisking often. (This is very important as your stew could break if not attended to.) Season to taste with Worcestershire, Tabasco and kosher salt. Add oysters to the stew and when the edges begin to curl, 3-8 minutes depending on the size of the oyster. Remove from heat and serve. *I use a rack above the flame of my stove to insure the lowest simmer possible. You may prefer cooking your stew in a double boiler to insure the heat is kept at a minimum.